Mega Moles are a giant species of Monty Moles that are impervious to many attacks. They wear sunglasses and act as bosses over the other Monty Moles. 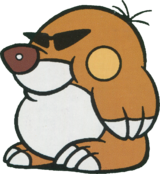 In Super Mario World, Mega Moles are exclusively found underground, debuting in Chocolate Island 4. They are invulnerable to Mario and Luigi's jump or Spin Jump moves as well as Fire Mario or Luigi's fireballs, but can be defeated by using Caped Mario or Luigi's spinning attack, a Super Star, a Grab Block, or a Shell. Like other enemies, they are also immune to hazards such as Munchers and spikes. Standing on a Mega Mole's head is not a danger by itself, and will allow Mario or Luigi to ride it. Unlike regular Monty Moles, they do not pop out of holes in the ground. Despite their size, they can be eaten and swallowed by Yoshi. 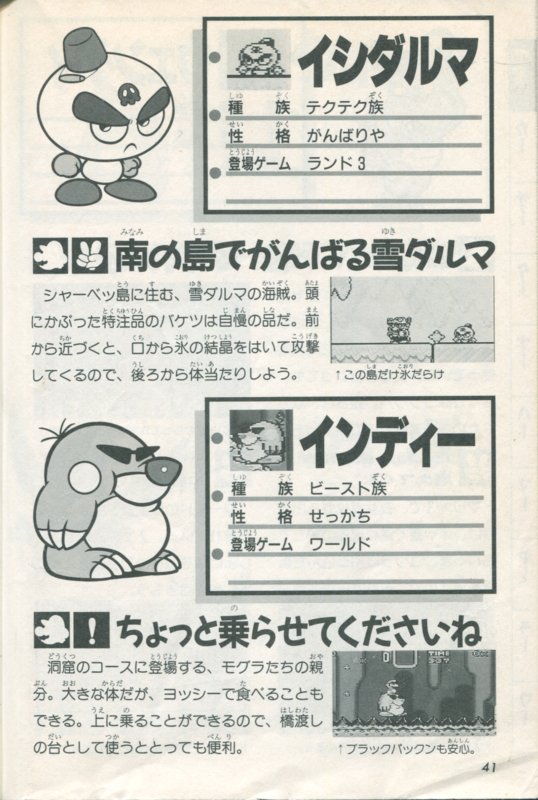 Mega Moles are among the few foes that can hurt Mario while he is riding Yoshi; most enemies merely result in the loss of Yoshi, while a few others both hurt Mario and force Yoshi to run away. 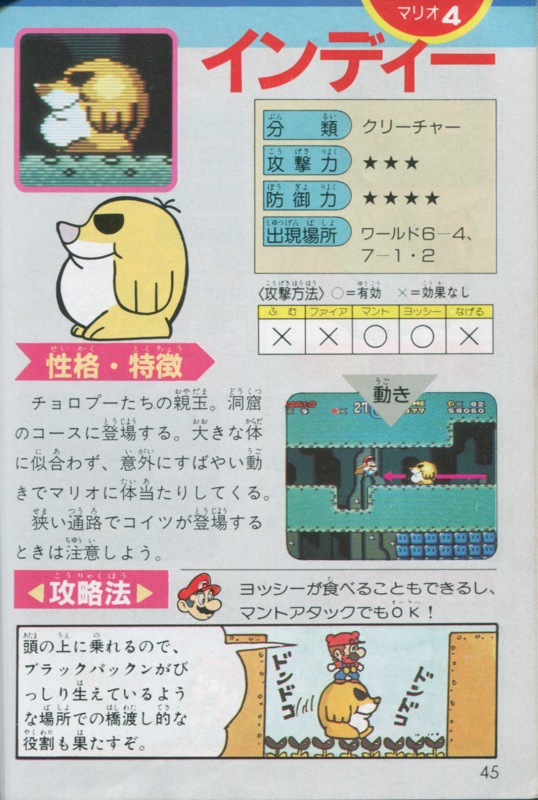 A Mega Mole appears in Mario Family, as one of the sewing designs. 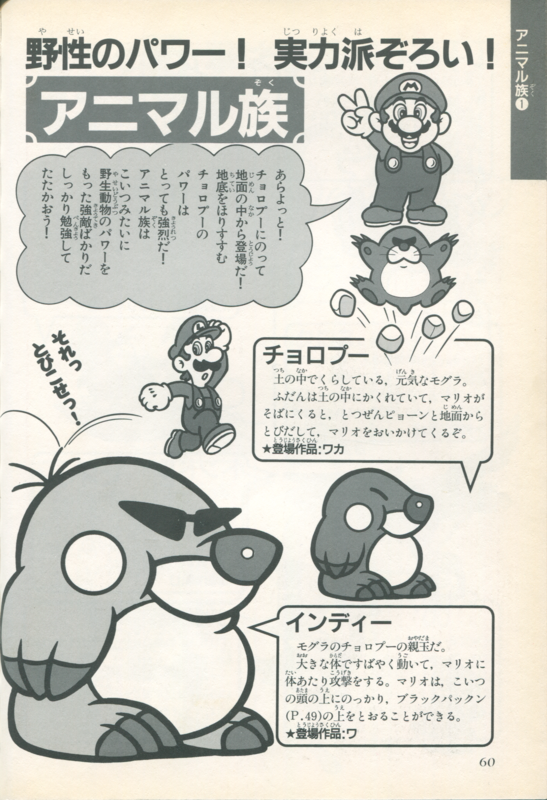 In the Nintendo Adventure Book Dinosaur Dilemma, if Mario offers apples to Yoshi and some dinosaurs he finds near Lake Trilobite, the dinosaurs will turn out to be Mega Moles in disguise, and will swarm Mario after removing their costumes, leading to a Game Over. Some more Mega Moles can be encountered in a decrepit mansion, and Mario can escape them by stepping to the side as they give chase, causing the nearsighted creatures to obliviously charge past him. Attempting to outrun the Mega Moles will lead to a Game Over, when Mario blindly falls into a watery pit inhabited by a Blargg. Some Mega Moles appear among the crowds at the International Dino-Flying Derby in Flown the Koopa, and eye Mario and his friends hungrily when the show ends. Later, if Mario and Luigi don some Mega Mole costumes, some real ones will approach the two with gifts, and take them to their cave lair if the Mario Bros. choose to follow them. Once in the caves, the Mega Moles continue stuffing the plumbers with food, before weighing them down with "gifts" and swarming them, as Mario discovers too late by skimming through a book called Mega Moles in the Mist. Finally, another group of Mega Moles will attack Mario and Luigi, causing a Game Over, if they decide to explore a dark portion of Magikoopa's Fortress with a flashlight, which quickly dies on them. In Unjust Desserts, some Mega Moles are shrunk by Magikoopa, and sent into Yoshi's body after Mario, though the hero never encounters any inside the dinosaur, just in the palace garden when he and all the creatures Yoshi and Luigi had eaten are spat up by them. This page was last edited on April 22, 2019, at 12:29.